Web Design & Development Services - Rhubarb Media Inc.
As a client-centric studio we base our solutions completely on your needs and the needs of your end user. We do this not only in a design and development capacity, but also by working with you to come up with a system that can meet your needs within your budget and timeline. Rhubarb loves to develop on the open source content management system (CMS) and web application framework of WordPress. This allows our clients the ability to post, edit and remove content information such as photos, videos, and documents. WordPress is a free and open source blogging tool and a content management system (CMS) based on PHP and MySQL. Features include a Plugin architecture and a template system. WordPress was used by more than 22.0% of the top 10 million websites as of August 2013. WordPress is the most popular blogging system in use on the Web, with more than 60 million websites. It is user-friendly and can grow as your company grows and expands. Database-driven dynamic content management for manipulating text, image and video content, internal hyperlinks, open URLs, viewable stale-dated pages, staff profiles, news bulletin, events calendar, online forms, responsive design to work with all mobile devices, predictive site search function, trending topics listing, includes content approval mechanism for admin user document management. But we are also all about security, which is why all web Forms include spam deterrent and validation technologies. As a showcase website, our proposed design solution is a clean, simple and consistent layout and design. The site’s overall design will complement client’s branding strategies and initiatives and remain consistent with the current mobile application. The key landing page will use a slide deck approach to tell your story through bite-sized amounts of content that the user can scroll through at their own pace. The written copy will be accompanied by high impact visuals, utilizing subtle design techniques to add to the premium user experience. 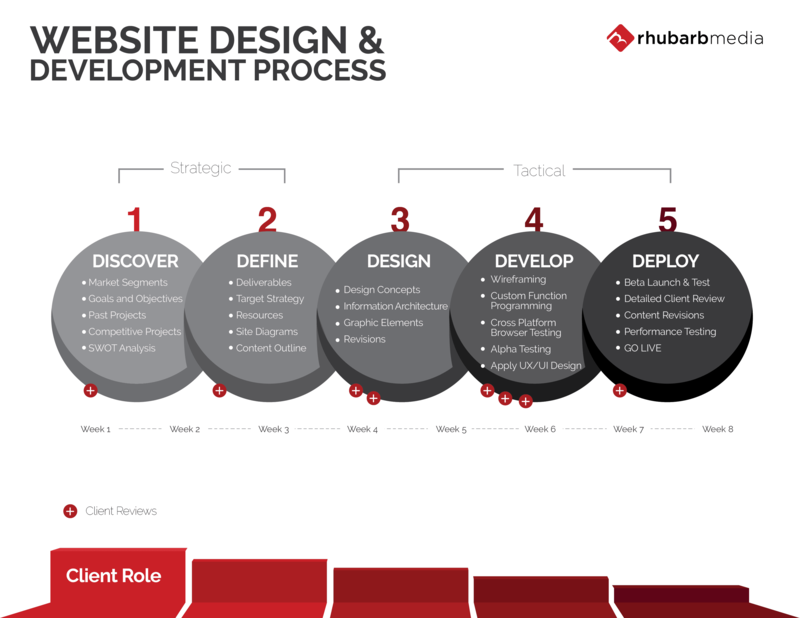 Rhubarb Media always uses best practices in content strategy and online communications when developing a website. Website design and layout should always allow users to find information easily and quickly in the format they desire. A website should function as an interactive source of information reducing the need for routine phone calls or email correspondences and frequently asked questions. Rhubarb Media will work within the required federal, provincial and AODA standards and guidelines to ensure that accessibility standards (WCAG 2.0 [Level AA] Guidelines), privacy and other policies are adhered to. We do this by using checkpoints and testing in each stage of the development process. The intended design has accessibility issues in mind, including contrast and intentionally building the site for advancing through content quickly using audio cues and keyboard commands for voice over features. Due to the fact that modern browsers and operating systems have accessibility tools built in, we suggest including an educational web page that details the use of these features. As staff continues to iterate and add new content, we recommend periodic reviews to evaluate the site’s compliancy to the WCAG 2.0 guidelines. The most common problem is missing IMG element ALT attribute tags (text descriptions of photos). As a standard, Rhubarb Media develops and tests websites to work on all modern browsers including all versions of Chrome, all versions of Safari, and Internet Explorer down to and inclusive of IE 8. We are able to make the site compatible with Internet Explorer 7 and lower for an additional fee at the request of our client, however we have found that the time and cost involved in doing so is generally not to the client’s best interest considering the percentage of the market using these older browsers. The intended website will consist of a responsive design so that regardless of the browser window size, the site will function and display properly including on mobile phones. This form will give us the basic info we need to get rolling on your quote. So you have a website... what's next?